Derby missed the chance to start 2016 on top of the Championship after being held to a draw by Leeds United. The pre-match build-up was dominated by Leeds' refusal to allow Sky TV cameras into the ground, but they relented after the threat of a disrepute charge. Derby took the lead when Jeff Hendrick dribbled through two defenders and finished, before Sol Bamba levelled. Chris Wood's header put Leeds ahead in the second half but substitute Tom Ince secured a point for the Rams. Derby are second in the table, a point behind leaders Middlesbrough. Leeds "reluctantly" allowed Sky to broadcast the match, confirming their decision about four hours before kick-off. They had initially barred cameras from entering Elland Road, as club owner Massimo Cellino was unhappy at the number of their fixtures moved for live coverage. The Italian claimed moving games was affecting attendances - this was the Whites' ninth league match to be shown live on television so far this season - but the broadcaster was eventually allowed in. Hendrick gave Paul Clement's side the perfect start with his silky run and cool finish, but Leeds captain Bamba got the equaliser after Derby keeper Lee Grant spilled a free-kick and then pushed Stuart Dallas' chip into the defender's path. New Zealand striker Wood nodded home Sam Byram's superb right-wing cross to give Leeds the lead but Ince scored within three minutes of coming on for the visitors. The winger latched onto Johnny Russell's first time-flick to drill home, before the hosts' keeper Marco Silvestri palmed away Bradley Johnson's header to secure a draw. "It was always going to be a big ask. "We felt from a footballing perspective, from a sporting integrity point of view, we felt disadvantaged that a team as good as Derby could have an extra day's recovery. "When you go in front in the 71st minute, I think that's when you need the oxygen mask in a normal week. "So when you've played 48 hours before, it makes it a double oxygen mask and that was probably why Derby got a point." "Three changes, I wouldn't say that was particularly significant. But then you have the value of those players to make an impact. "It's been a busy period, we've played six games and we have another very big game on Saturday at Middlesbrough, so you take those things into consideration. "We pushed first of all to get back in the game with the equaliser and then we were pushing for all three and the sense from the players is that the game was there for the taking. "We certainly didn't have things all our own way, but I thought we did enough to get more than just a point." Match ends, Leeds United 2, Derby County 2. Second Half ends, Leeds United 2, Derby County 2. Substitution, Leeds United. Kalvin Phillips replaces Sam Byram. Attempt missed. Lewis Cook (Leeds United) right footed shot from outside the box is high and wide to the right. Assisted by Sam Byram. Corner, Leeds United. Conceded by Lee Grant. Attempt saved. Luke Murphy (Leeds United) right footed shot from outside the box is saved in the bottom left corner. Charlie Taylor (Leeds United) wins a free kick in the attacking half. Attempt missed. Liam Cooper (Leeds United) header from the left side of the box is close, but misses to the right. Assisted by Luke Murphy with a cross following a set piece situation. Lewis Cook (Leeds United) wins a free kick on the right wing. Corner, Derby County. Conceded by Charlie Taylor. Attempt blocked. Jeff Hendrick (Derby County) left footed shot from the centre of the box is blocked. Assisted by Chris Martin. Attempt blocked. 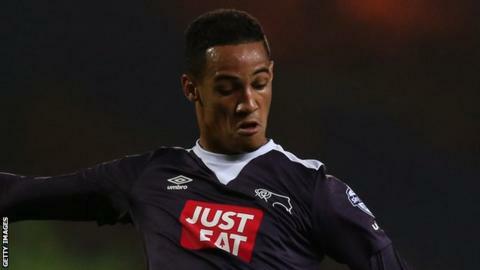 Tom Ince (Derby County) left footed shot from the left side of the box is blocked. Assisted by Chris Martin. Attempt missed. Johnny Russell (Derby County) left footed shot from the right side of the box is too high. Assisted by Ryan Shotton following a set piece situation. Attempt saved. Bradley Johnson (Derby County) header from the right side of the six yard box is saved in the centre of the goal. Assisted by Jacob Butterfield with a cross. Goal! Leeds United 2, Derby County 2. Tom Ince (Derby County) right footed shot from the centre of the box to the bottom right corner. Assisted by Johnny Russell. Substitution, Derby County. Tom Ince replaces Andreas Weimann. Substitution, Leeds United. Souleymane Doukara replaces Chris Wood because of an injury. Delay in match Chris Wood (Leeds United) because of an injury. Attempt missed. Lewis Cook (Leeds United) left footed shot from outside the box misses to the left. Assisted by Sam Byram. Goal! Leeds United 2, Derby County 1. Chris Wood (Leeds United) header from the centre of the box to the centre of the goal. Assisted by Sam Byram with a cross. Corner, Derby County. Conceded by Chris Wood. Attempt blocked. Andreas Weimann (Derby County) right footed shot from the centre of the box is blocked. Assisted by Chris Martin. Foul by Jacob Butterfield (Derby County). Substitution, Leeds United. Lewis Cook replaces Tom Adeyemi. Substitution, Derby County. Chris Martin replaces Darren Bent.